As I boarded the shuttle bus from the Redcliffe Showgrounds to the Festival of the Sails at Suttons Beach, a woman commented on the impressive camera around my neck. She told me she had a PhD is camera use where PhD stood for Push Here Dummy. Appearances, I assured her, could be deceptive. The camera was impressive. The photographer was not. Almost all the time I use the Push Here Dummy automatic method. Yes, there are manual settings but that would require reading the manual. Today, as it turned out, I didn't even get to push the f***ing button because doing so would have required taking the memory card out of the computer and putting it back in the camera. That didn't actually happen so the only button I got to push was on my iPhone. But given it was a beautiful day, there was nothing to lose. 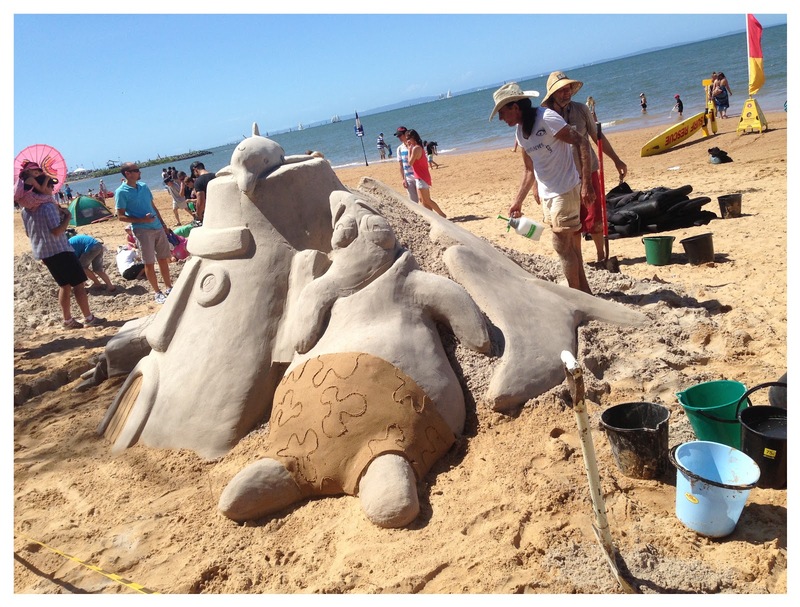 Kite flying, beach cricket, sand sculpting, swimming, rock climbing and fresh sea air, it would have been churlish not to do what all the other families at Redcliffe were doing and just enjoy the day. Wow, beats a sandcastle any day! Susan these are amazing! I love the story, amazing what natural light can do for any photograph!You always manage to find the most inspiring shots to take. That is a great photo. I only have a point and click camera because anything else would be wasted on me. I am glad your phone let you capture the memories of the day. Great picture and the little tale made me laugh too :) Us Brits are very jealous of your lovely warm, sunny weather. I love sand sculpting, definitely not something for dummies to do! I'd kick myself if I forgot the SD card, I feel for you. Pretty damn good photo for an iPhone though!